Updated Setting Guide, and chapter 3 of the campaign, are now available! Since the release of the Seven Worlds Setting Guide six weeks ago I've received dozens of comments and feedback. As a result, I'm proud to announce that today we're releasing an updated Seven Worlds Setting Guide PDF with collected errata and rules fixes! The updated file is available for download in your library at DriveThruRPG or RPGNow. Keep the comments coming! Into the Fire, the third chapter in the Seven Worlds campaign, is now available as well! In Into the Fire, several months have passed since the fall of Nouvelle Vie and humanity is fighting a losing war against the alien invaders now known as the Devourers. The heroes are asked to go on a long-shot mission to find an alternative way to stop their enemy. The trail and an anonymous message leads to a political war between corporations in the frozen planet of Apollo, where the heroes have to storm a faraway research facility that has been taken over by terrorists. One of these terrorists has a clue the heroes need if they hope to find a way to save the Seven Worlds from annihilation! Into the Fire also includes seven new side stories so your players can explore the Seven Worlds while they play the main campaign! And of course, all the Chapter 3 GM-only support files and maps are available for free at the GM Downloads page! If you were a Gamma-, Delta- or Epsilon-level Kickstarter backer you should have Into the Fire available as a new PDF in the Seven Worlds Campaign Subscription you have received through DriveThruRPG/RPGNow. Haven't received your backer links and rewards yet? Did you fill out the contact survey so we could send you the rewards? If you didn't, go ahead and fill the survey. If you did and have not received anything, contact me at luis@intellistories.com for help. 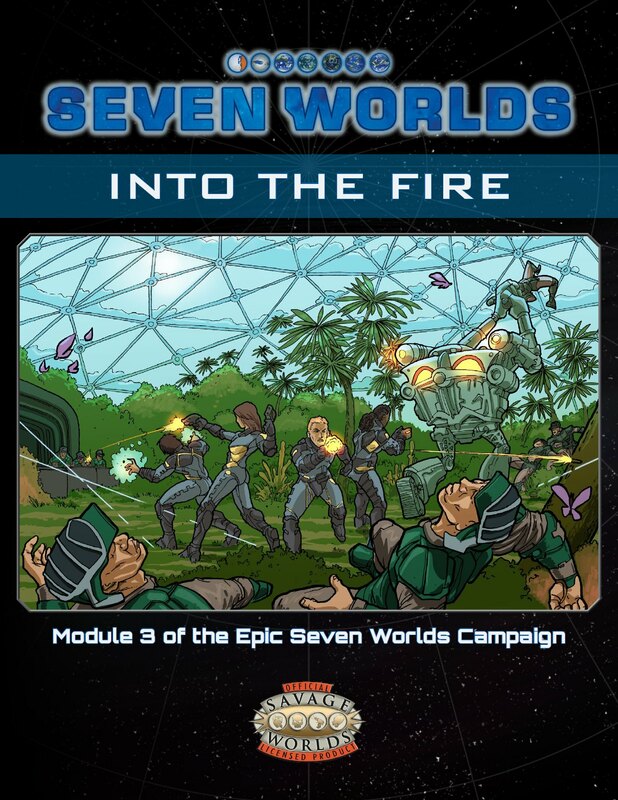 If you were not a backer for the campaign modules, you can still purchase Into the Fire as a stand-alone module at DriveThruRPG/RPGNow, or as part of the Seven Worlds Campaign Subscription. Purchase the subscription to get all seven modules (as they are released) at an almost 20% discount when compared with single module pricing. On top of that, the subscription also includes the full Seven Worlds Campaign Book (a 253-page one volume compilation of all seven modules with exclusive Campaign Book cover art) at no extra cost! And if you still don't have it, don't forget to get the award-winning Seven Worlds Setting Guide, the core book for the setting! The fourth chapter in the Seven Worlds saga is here! Chapter 2 of the campaign is out!